I doubt that anyone will actually read this before playing H-S for the first time but I'm fairly certain new and confused players will come to the forum asking the questions that everyone was too busy staying alive to answer In-Game for you. To those few of you who have yet to play H-S, welcome to one of the best HL2 mods currently playable. The back-story is on the main site and I suggest you read it if you have not done so already. The Lowdown: Hidden source is a "Mutant" type tactical squad shooter that utillizes a round based scoring and spawning system. A "Mutant" game is a game in which one player (the mutant) is pitted against all the other players. The mutant will often have several advantages over the other players in order to help them survive against the superior numbers of the non-mutant players. The mutant scores by killing the other players, the other players score by killing the mutant in addition, the individual who kills the mutant then respawns as the mutant and the game continues. observe that I said "invisable" and not invisable. I would describe the Hidden's invisabillity as similar to that of a Fox registered character, but if I so much as utter it's name on this forum H-S would run a huge risk of getting Foxed. So, now that you hopfully have an idea of what the game is about, you should be able to play. But before I finish up, I will show you how to see the Hidden, and I have a[IMG]ÿØÿà[/IMG] screen shot to help me. Last edited by Boxy; 25th July 2005 at 09:03. 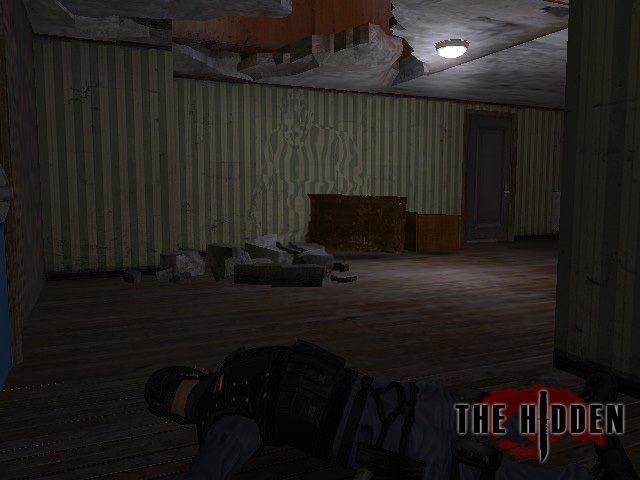 #2der Hidden eine art Gen-experiement das ihn wie im Film "hollowman" fast unsichtbar machte, man sieht ledeglich einen hitzeshader/hitze welle. Kommen wir wieder zu den marines, es gibt nur 2 marine klassen. Am anfang der ersten runde wird gewürfelt wer Hidden ist. Der Marine der den hidden tötet wird nächste runde zum hidden. Die erste Klasse besitzt eine Maschinen Pistole und eine normalen pistole. Die zweite Klasse besitzt eine Schrotflinte und ebenfalls eine normale pistole. Man hat nicht unbegrenzt muni daher sehr sparsam sein und darauf achten wann man nachlädt, der hidden ist nicht dumm (50 schuss hat die p90 wärend die Schrotflinte fast immer sofort schiessen kann. Der Hidden hat nur ein messer welches eine sekundär attacke besitzt die ca 3 sek dauert aber dann ist der genger meistens sofort tot. Ausserdem hat der Hidden eine art leap, dass heißt er kann hoch springen mit einer taste namens "hidden pounce". Last edited by Price; 28th August 2005 at 19:38. Here's another one close up the hidden is on the box directly in front of the camera. Last edited by #jj; 24th October 2005 at 12:25.
oohh! me newb! downloading the mod at the moment, almost done. K but just one thing...don't think its boring because you get owned at start...once you get to play the game good you will like it. to be honest, i ain't that good when it comes to MP games, cept RPG's. But i aint bothered if i get pwned like every 5 seconds, i'm just in for the fun i guess. That is a cool shot, i dont care what anyone says... Yes i took it, but its still ****in' cool! Last edited by The Druid; 3rd September 2005 at 00:43.